Furniture can be the deciding factor in transforming a house into a home. The Furniture Doctor is a business located in Bloomfield, NY, that understands that the furniture you choose to add to your living space is crucial to developing a personal aesthetic that complements your family life. That’s why they offer a wide array of new furniture and furniture restoration services to help clients achieve the precise interior design they want for their homes. 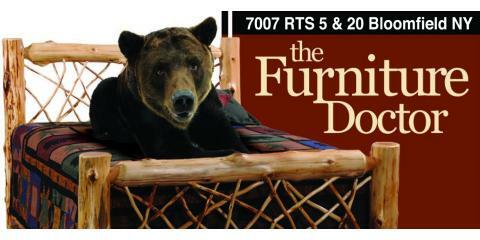 The Furniture Doctor offers a variety of new furniture items. With a showroom and four on-site cabins outfitted with fine rustic furniture, they aim to show customers how their furniture pieces can transform any space. Beyond a selection of Adirondack furniture and cabin décor, they also sell various types of rugs, including oriental, braided, and hook, as well as clocks. The Furniture Doctor also provides a wide array of furniture restoration, repair, and refinishing services that can renew any well-loved but damaged or outdated furniture. The Furniture Doctor has placed a strong focus on items handmade in America. Not only does this ensure timely delivery of products, but it also results in high-quality items. They’re also dedicated to customizing furniture and accessories to fit each customer’s personal home needs and interior design. They can create custom upholstery, window treatments, cabinets, specialty glass, and more so that each client’s home is uniquely theirs. Find well-made cabin décor and new furniture pieces at a well-established local store. The Furniture Doctor offers a wide selection of rustic furniture and home accessory options as well as a variety of individualized services to help you make your house truly your own. For more information about their available products and services, call (585) 657-6941 or visit their website. Like them on Facebook for regular updates and announcements.